New: Stanford U. This isn't exactly new, but I haven't mentioned it yet, so it's new here. Stanford University is now operating a very appealing nook within the iTunes Music Store. It's called Stanford on iTunes, and it's a source for audio recordings of Stanford lectures, interviews, music, and sports. You can also subscribe to podcasts of the same. And it's all free. Old: from wax to bits. From the University of California, Santa Barbara, comes the Cylinder Preservation and Digitization Project�a digital collection of over 5,000 wax cylinder recordings, many of which are over 100 years old. And they're all free. Not free, but good. The world's best-selling iLife book is going for $23.09 on Amazon.com�34 percent off the cover price. With The Macintosh iLife '05, you get 345 beautifully designed pages and a two-hour, 45-minute instructional DVD. Learn more and watch some samples, then order your copy. According to The Writer's Almanac, from American Public Radio and Garrison Keillor, "It was on this day in 1889 the Jukebox made its debut at the Palais Royale Saloon in San Francisco. It was called a 'nickel-in-the-slot player' and consisted of an Edison Class M Electric Phonograph inside a free-standing oak cabinet to which were attached four stethoscope-like tubes. Each tube could be activated by depositing a coin so that four people could listen to a single recording at one time." I'd have finished my review of Leander Kahney's newest book, The Cult of iPod , sooner, but I spent entirely too much time gazing at page 18. Those of you who already own the book can probably understand. The rest of you will have to buy a copy and find out for yourselves. You won't regret it. The Cult of iPod is a superb celebration of Apple's iPod and its impact on our listening habits, on the music industry, and on our culture. The Cult of iPod's 160 pages are packed with stories, observations, and photos that document the iPod's rise to stardom. We learn about Tony Fadell, the "father of the iPod," and see an illustration of an iPod prototype�housed in a shoebox-sized case to thwart industrial espionage. And we read a quote that should forever haunt The Mac Observer editor-in-chief Bryan Chaffin, who said of the original iPod, "the name is stupid, and the price is too high." Let's put The Cult of iPod into shuffle mode to see what else is inside. 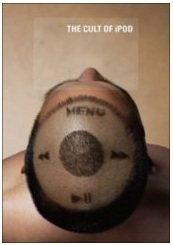 iPod viral marketing (don't miss George Masters' homebrew iPod ad). iPod bling (Fendi's $1500 iPod carrying case and Goldster Audio's $4300 Concertino, a tube-based iPod amplifier). MP3Js (iPod-based DJ sessions where you can play your own tunes). iPod hacks (viewing 3D photos using two iPods mounted side-by-side, mounting a pair of iPod shuffles on either side of a pair of sunglasses, among others). iPod scams (weird pyramid schemes, often conducted through eBay, aimed at getting you to pony up for a "chance" to buy an iPod for $40). Services that will make a photo you submit look like an iPod ad (I'm deeply offended that Leander Kahney didn't ask to run my iPoodle photo in the book). Kahney also examines the cultural implications of a world where we're all walking around with white earbuds in our ears instead of interacting with each other. Is that good or bad? In an interview with Michael Bull, a lecturer in media studies and culture at the University of Sussex in the U.K., we read the sad bottom line: "How often do you talk to people in public anyway?" If you're reading a copy of The Cult of iPod in public, you may find yourself interacting more than you might otherwise. It's an engaging and entertaining book that draws you�and onlookers�in. The Cult of iPod sells for $16.47 on Amazon.com. Highly recommended. Sorry for the dearth of posts lately; I've been busy and have had a cold, which I didn't want to give to you. For your reading pleasure: My review of Vertus' Fluid Mask is now online at Macworld.com. Fluid Mask is a cool Photoshop plug-in that makes it relatively easy to create cut-outs�to isolate a subject from the background, for example. "But Jim," you say. "You take hundreds of photos a week and spend 23 hours a day on Flickr. How could you not own a DSLR?" The cost of glass. You can spend several California mortgage payments outfitting a DSLR with a good range of lenses. And then you've got to haul those lenses around with you. The perils of dirt. As frequent visitors to my Flickr photostream know, I take a large percentage of my photos at beaches and on dusty dirt roads. Dirt and sand can enter a DSLR when you change lenses, and a dirty imaging sensor can be very tricky to clean. No, for me, the DSC-F828 hits a lovely sweet spot between price, capabilities, and design. Sony is on the verge of releasing what might be a sweeter sweet spot: The $999.95 Cyber-shot DSC-R1, which uses a breakthrough 10-megapixel imaging sensor that's physically much larger than the sensors in most digital cameras, allowing for lower noise and fewer artifacts. Besides the innovative sensor, there's a lot to like in the R1, including a two-inch, swiveling LCD screen and a zebra stripe mode that superimposes warning indicators on highlight areas that will be overexposed. Alas, in a design decision aimed at breaking my heart, the R1 does not have a movie mode. That isn't a deal-breaker for me, but I would miss having the ability to grab a minute or two of action or audio. All of the digital camera sites have written previews of this new camera, which ships later this month. Here's DP Review's preview. But the most interesting comments on the R1 come from photographer Michael Reichmann, who writes, "this new digicam may well provide image quality comparable to that from current DSLRs, and with pixel density exceeding nearly any of the competition, digicam or DSLR." It's an essay worth reading, whether or not you're interested in the R1. I'm not recommending the R1 here, as I haven't seen or used one. But I'm keeping a close eye on this new camera, and if you're in the market for a high-end camera but a DSLR doesn't make financial or practical sense, you should, too. Oh, and I should add that I do own an SLR: a Minolta SRT-101 that I bought used in 1975. It still works, or at least it did several years ago, when I last used it. And now, your Monday m�lange. Does your PowerBook, you know, vibrate? Regarding the 7200-rpm drive in my new PowerBook, a reader asks, "Have you noticed a little vibration through the hand rests of your new 15" PowerBook? It should be perceptible if you place the PowerBook on a hard surface." Answer: Yes, I can feel a very subtle vibration. It almost feels like the computer contains a small metal platter that's spinning around in circles 120 times every second. I don't mean to be snide�heck, yes I do�but I'm just not seeing (or feeling) the "defects" that others have reported. "Stippling" on the screen? Don't see it. Noisy 7200-rpm hard drive? Not particularly, and I so despise computer noise that my G5 lives in a cabinet 25 feet away from my desk. I'm not saying folks aren't seeing, feeling, or hearing problems. I'm just weighing in to say that I haven't. I'm picky about technology that I pay in excess of two grand for, and so far, I'm a happy spender. A Podner for your iPod video Splasm Software's $9.95 Podner looks like a fine tool for converting video for playback on a fifth-generation iPod. According to MacCentral, the new 1.0.1 version preserves the audio in MPEG-format movies. That's a big deal if you, like me, have a Sony digital camera that records video clips in MPEG format. Many MPEG-to-movie conversion tools strip out the audio from such movies (more details). A couple of readers have written to say that the Life Poster workflow I published here last July doesn't work under the latest version of Tiger, 10.4.3. So...presenting Life Poster 1.2: an update that not only fixes the 10.4.3 incompatibility but adds an installer that puts everything in the right place for you. There's no need to manually import the action into Automator now; the installer does it for you. So don't delay; download today. This version also works in earlier versions of Tiger. We're all busy; I'll be brief. Flickr beyond the computer. Flickr, the planet's most innovative and addictively fun photo-sharing service, has unveiled some cool new services. You can print books and photo-mosaic posters, make DVD slideshows from Flickr photos, and put your photos on US postage stamps. Check them out. More on new PowerBook performance. My colleagues at Macworld Lab have put Apple's new PowerBooks through their paces, and the results aren't surprising: the 1.67Ghz 15-inch PowerBook performs roughly identically to its predecessor. Alas, Macworld didn't test the 100GB, 7200-rpm drive that's available as a build-to-order option. As my Xbench tests showed, the 100GB drive delivers read/write performance that's up to twice as fast as the stock 80GB drive. 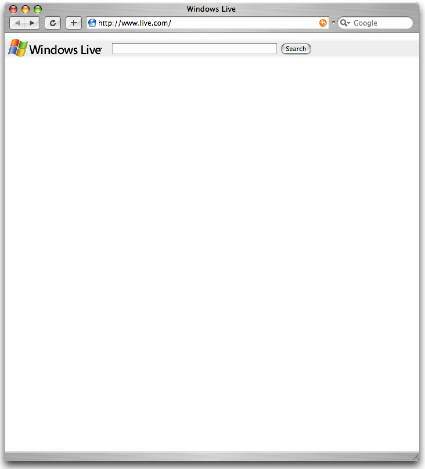 Of course, I didn't expect Microsoft's newly announced Windows Live site to deliver a rapturous experience on a Mac�it isn't intended to. But when I went to the site today to check it out, I expected a little more than this. I'll say this for the design: it's uncluttered. I kid you not�read it for yourself. Look for the PD's hard-hitting investigative reporting staff to unmask brisk candy cane sales next month. To its credit, the PD did win a Pulitzer some years back. For photography.